If we’re going to leave this planet in a better shape than that in which we received it, people must dance and sing – and not strictly in the shower. When I was young, I dreamt of being a dancer that would spend my days in the spacious freedom of the studio amongst artists and my nights at the theater under the spotlight. In a world where most people treat their bodies as means of transportation for their heads (and in the best cases maybe their hearts too), I aspired to remind people of what’s truly important… the visceral experience, being present in one’s body, sharing the human experience without a screen in between. I dreamt of eyes wide open with astonishment and huge crowds sitting at the edge of their chairs clapping wildly with excitement at the end of the show, leaving wanting more… of me. As I grew older, I began second-guessing myself… I noticed something meaningful was missing. And if I still had any doubt that I had another life mission waiting for me, I finally realized who I am and what I do when a blind elderly woman got out of her chair, stretched her hands out to me, and without words, invited me to dance. Going back a decade, I used to hold the childish misconception that teachers are the ones who weren’t good enough to make it in their industry. At high school I promised myself that I would never be in the humiliating position I took my teachers to be in, trying so hard to make something of rebellious kids who would never cooperate. I told myself I would never ever be a teacher. A slightly less childish version of myself, I now know that teachers have one of the most exciting jobs of all. They don’t just transfer knowledge; they facilitate growth. Inspire private journeys of evolution. They create the space for transformation. 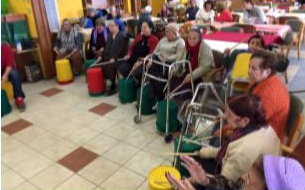 I met Shoshana from Casablanca, the blind woman, at a Rhythm Therapy (drum and dance) workshop I facilitated at an aged care home for Moroccan and USSR immigrants. Many of them were incapable of full participation with shaky hands and heavy legs, but as always by the end of the day, even the most sour-faced tough guys softened into the music. 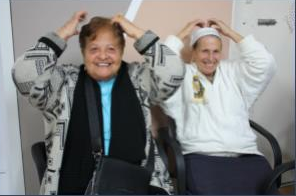 When we gave out the drumsticks, the ladies beside Shoshana said, “oh she doesn’t see so she can’t play.” Initially startled, my colleague Stefano showed initiative and placed the drumsticks directly in Shoshana’s hands and directed them to the bucket in front of her. From that moment on, she was our most enthusiastic participant, defying expectations and transcending her disability in song and dance. Her husband’s eyes were gleaming with wonder as he watched her dance hand in hand with me like a perfectly able young woman. Stefano and I were similarly overwhelmed with our ability to give such a gift: to allow people who spend the majority of their time sitting lethargic in a chair to become so expressive and lively. At the end of the workshop, the wave of gratitude we received was stronger and more heartfelt and empowering than ten standing ovations. It took a long time for me to realize, accept, and verbalize that I am no longer chasing the same tiring dream of being a world-touring soloist. It took a process of releasing old concepts and tying together loose ends in my mind. Theaters full of audiences won’t validate it if I won’t: I am a dancer and I will always be a dancer. But dancing in a theater for only those who can afford a ticket, spending days and nights practicing only for them to go home and go on with their lives was never enough for me. I felt it in my bones that the face-to-face and heart-to-heart connection is necessary if I’m going to inspire any real change. And change is necessary. Prancing about when so much needs fixing in the world seemed straight up disconnected. So I chose the one thing I’m good at – or maybe it chose me… inviting others to dance. Allowing thinkers and doers to pause for a moment from the brain-race and connect to their innermost physical layer of self. Making space for people to express themselves in an honest, non-premeditated form. To take their foot off the brakes and surprise themselves with the potential that exists within them, just waiting to be realized. Because art isn’t just for artists, it’s for everyone, and it is the best therapy in a world disconnected by technology and separated by definitions of ‘I’. In every culture throughout the ages, music and dance were used to bring the community together in mourning or celebration. They knew that being in art is being in unconditional love for oneself, which can then be extended towards others. That it is being without borders, being together with many, but ONE. That is why I am a teacher. And why I do believe that if we’re going to leave this planet in a better shape than that in which we received it, people must bask in the freedom of dance and music not strictly alone in the shower, but out on the streets and together. Posted on February 1, 2015 July 22, 2015 by alisonarnold7Posted in English, IdentityTagged dance, identity, israel, yala young leaders.